Raspberry Pi Infrared Camera Module Featuring the same 8 megapixel image sensor as the standard Raspberry Pi camera with the infrared cut-off filter removed to increase IR light sensitivity. The Pi NoIR is compatible with all Raspberry Pi models and provides high definition, high sensitivity, low crosstalk and low noise image capture in an ultra small and lightweight design. 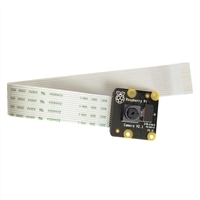 The camera module connects to the Raspberry Pi board via the CSI connector which is capable of extremely high data rates and it exclusively carries pixel data to the processor.